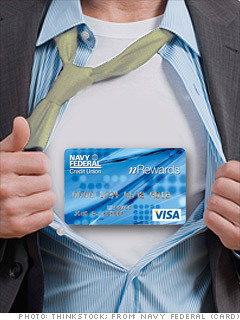 Any active or former military member -- or relative of one -- that has bad credit should take a look Navy Federal Credit Union's secured card. The card boasts a low APR that starts at 8.99%, a rate normally only offered to consumers with excellent credit, said John Ulzheimer, CEO of SmartCredit.com. In addition to the low rate, there's no annual fee and a reward program that lets customers earn points for every dollar they spend. Those points can later be redeemed for merchandise or gift cards. After 12 months of good behavior using the card, cardholders can get switched to an unsecured card. The only catch: the card isn't available to everyone. You have to be a member of the credit union to apply, and membership is only available to military members and their families. But it's a great deal if you qualify, said Ulzheimer. Credit card issuers are starting to ramp up lending to consumers with less than perfect credit, but be careful not to jump on an offer too quickly.